Lock in a great price for Vincenzo Family Rooms – rated 9.8 by recent guests! If you want to go to Tinos a stay at Vincenzo’s will be the best choice! He greets you for checkin and from the moment you walk in you feel like you’re in a little oasis. The place offers amazing service, super clean rooms, food is delicious, nice extra touches like a bottle of wine in room and fresh fruit and also turn down service. Vincenzo is so hospitable and a great host. So many good things to say about this place and owners! We simply didn’t want to leave and can’t wait to go back! Thank you Vincenzo for an amazing time in Tinos! The breakfast which is served in an alfresco garden is delicious and plentiful...to say the least. There were homemade breads, pastries, fruit, pancakes, local cheeses and more - all brought to our table. We were so full that we couldn't finish our foods so our server kindly wrapped 'to go' packages that we later enjoyed on the ferry. Additionally, the staff is incredibly friendly and helpful and the rooms and grounds are spotless. The hotel is conveniently located in a walking distance to Tinos town. This was our second time staying here and we will continue to come back on every visit to Tinos! The breakfast- This breakfast was over the top amazing. Fresh, quality, and more than you could possibly eat with fresh orange juice and coffee. We were even offered tinfoil to wrap up what we couldn't eat for snacking later. Eggs to order, fresh fruit, and my favorite was the best yogurt we had all trip. The room- I believe that we got an upgrade - we were booked into the cheapest of rooms. Our room was stunning. We ended up staying on Tinos for a few more days, and after our original two nights here we never found such a nice place (though some were more expensive). The location - Quick walk into the interesting parts of town. The staff - Exceptional. Absolutely perfect from the cleaner to the breakfast waitress to the owner's family. Breakfast luxurious, room spotlessly clean, the staff were excellent! Alexandros picked me up from the port, settled me in with a drink and a sweet, and told me about the island. Alexandros Family Hotel is in a quiet street, a very short walk to the church, museum, tavernas and shops in tiny streets, and to the local bus stop to discover more of this beautiful island. The staff go above and beyond to make your stay memorable in this beautiful hotel. WONDERFUL staff - Vincenzo personally picked us up from the ferry station and met our every need. We asked where we could do laundry and he insisted his staff do it (was laundered and ironed to perfection.). Such friendly and wonderful people. The room had an excellent mattress (important when traveling Europe) and was remodeled. He gave us a tour of two rooms and asked which we preferred. We have stayed in luxury hotels all around the world and this should be considered more than a 3 star!! Oh - and the breakfast was so wonderful in the morning. They even packed us a lunch for the ferry. We will definitely be back - thank you for the excellent service and hospitality!!!! Location cleanliness hospitality breakfast the rooms trasportation from and to the port ...everything was perfect. value for mone?1000%. Absolutely great rooms, super great hospitality, and over the top breakfast. We even requested a small amount of wine in the late evening and were treated to wonderful snacks, no charge. Everything about this place is exceptional. The service and attentiveness of staff is exceptional the rooms and complex is very very clean - clean towels every day, breakfast is excellent with a taste of everything fresh and local and made on demand. The staff and owner Vincenzo are the most hospitable, caring hosts I have ever experienced in my travels!! My niece became ill during our stay - Vincenzo and his staff were attentive and went above and beyond to make sure she was looked after. Many thanks to Vincenzo and the team and I hope to visit again! Breakfast was amazing and all the staff and the owner were very keen to make our stay the best it could. The garden where breakfast was served is lovely. The shower was the best I have had in a Greek island and our room was cleaned thoroughly daily. Tinos itself is wonderful. Located in the religious district of Tinos, this charming property offers a wide variety of well-appointed rooms and apartments complete with a picturesque courtyard and spa facilities. With its wooden beams and slate flooring, Vincenzo Family Rooms is full of character and charm. Choose from an array of accommodations to suit your holiday needs. Benefit from modern amenities, such as free wireless internet, within a rustic setting. Start the day with a delicious breakfast on Vincenzo’s terrace. Enjoy relaxing afternoons among the flowers in the courtyard. Take a short walk to the port or visit the famous Panagia Evangelistria (Our Lady of Tinos) at a distance of 2,650 feet. 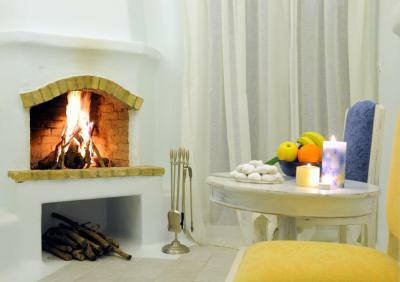 For health and well-being, Vincenzo Family Rooms also provides a variety of soothing massages. Spend some time in the hot tub or try a Turkish steam bath. Herbalife healthy breakfast consisting of handmade local products, and a wellness test can be provided upon request. Guests will find Costas Tsoklis Museum at 6.8 mi from the property, the Holy Trinity monastery at 0.9 mi, Vincenzo Solar clock right next to property and the Archaeological Museum at 2,300 feet. The center of Tinos Town is 750 feet away. 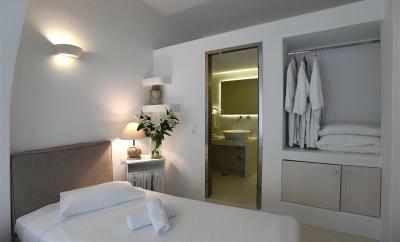 Vincenzo Hotel’s warm Greek hospitality combined with thoughtful amenities make it an ideal base for exploring Tinos. 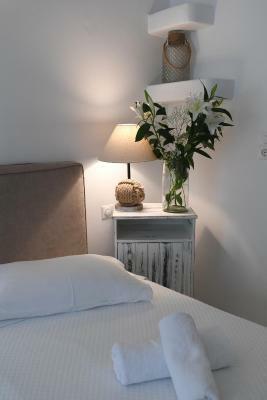 When would you like to stay at Vincenzo Family Rooms? Elegant room with stone details or white hues, individually decorated featuring a plasma TV. Free toiletries and a scale can be found in the bathroom. Some rooms of this type have stone details and their entrance is from the shady gardens. It comes with a plasma TV, while free toiletries and a scale can be found in the bathroom. Features a balcony with street views and a big 60-year old cactus tree. It comes with a plasma TV, while free toiletries and a scale can be found in the bathroom. This apartment consists of 2 separate bedrooms and a kitchenette with fridge. It comes with a plasma TV, while free toiletries and a scale can be found in the bathroom. 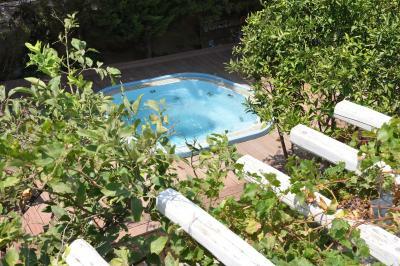 It opens to a balcony with views of the tree-garden and the outdoor hot tub. Spacious room with spa bath decorated in white hues. It comes with a plasma TV, while free toiletries and a scale can be found in the bathroom. 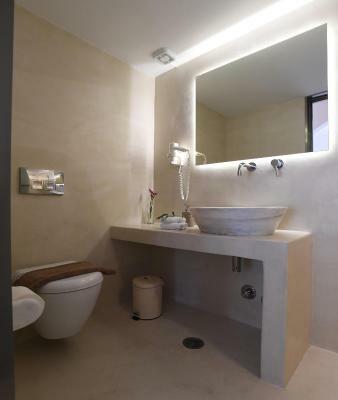 Consists of 2 interconnecting rooms in Cycladic style; the one features a bathroom with spa bath, while the other has a bathroom with shower. They come with a plasma TV, while free toiletries and a scale can be found in the bathrooms. Car rental is included in the price. It comes with a plasma TV, while free toiletries and a scale can be found in the bathroom. 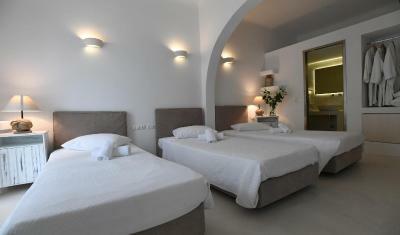 Our Family Hotel is situated in the centre of town, is easy to find, and is close to all the important sights in Tinos. Although it is in the centre, our green gardens are secluded and silent, making the place perfect for your holiday. 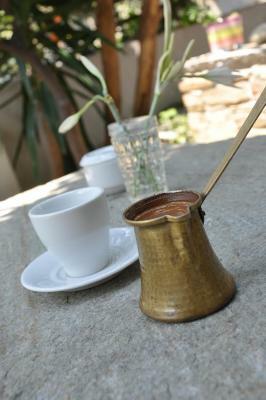 The breakfast includes local Greek delicacies. We offer free hydro massage, jaccuzi, and steambath. You are welcome at any time of the year! House Rules Vincenzo Family Rooms takes special requests – add in the next step! Vincenzo Family Rooms accepts these cards and reserves the right to temporarily hold an amount prior to arrival. Please inform Vincenzo Family Rooms of the time of your arrival and you will be met at the port. Unfortunately we were there during the off season so the hottub wasn't available, even though it was advertised in pictures. I have never experienced hospitality like this place. It is truly amazing!! Staff was so welcoming, hotel was so cute, and great location. Definitely a hidden treasure. First impression was from them contacting us immediately after our booking was made. Big score there. The welcome was warm and right from the port. The team went above and beyond with their hospitality and were all very friendly. Service was prompt at all times. We will definitely be back and with family and friends. Vicenzo was the best host! Breakfast was incredible and the room was very comfortable. He made our stay very pleasant, and was extremely helpful. The hotel is neat and clean, justo a few impecable bedrooms. We has everything we needed, and our host made sufre of it! Totally recomendable. Thanks Vicenzo! Excellent service , Owner and personel very helpful ! Amazing breakfast . Staff couldn't do enough, very central location and too much breakfast! The location, breakfast and hospitality are amazing. The rooms are clean, spacious and comfortable. The best host ever - Vincenzo came to pickup us from the port in the middle of the night. Room was very clean and spacious. Thank you very much for short but perfect stay. Everything. Clean rooms, great breakfast with wonderful staff and great hosts. 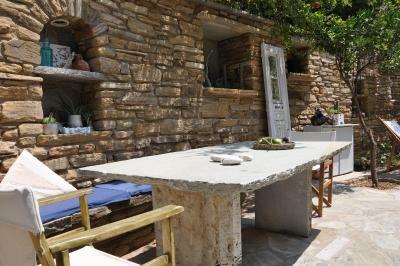 Location perfect 2 min walk to the main part of Tinos. Highly recommend and will go back. Vincenzo is the top! The structure is very closed to the centre, great hospitality and kindness of the staff, the room is very nice, quite and clean, the towels changed twice a day. Maximum availability of Vincenzo for every need. The breakfast is amazing, sweet and salty, with fresh fruits in big quantity. Vincenzo is one more reason to return to Tinos! The rooms and the overall apartments were excellent, clean and with the best and latest equipment. The breakfast was very rich but above all was the hospitality of Vincenzo!! We would recomend it without hesitation. Shower in the bathroom would be a better option than the bathtub. There was no real wardrobe in the room. A bit noisy street if you sleep wit open windows. Vincenzo and the whole staff were amazing. Extremely pleasant and hospitable. Whatever we needed, they were there for us. Breakfast was incredible, the food just kept coming (be prepared to gain weight). Very nice garden in which breakfast was served. Room was cleaned twice a day like in 5 star hotel. They organized a seafood dinner for us fee of charge. They even offered laundry services for free. Last night of our stay we got a bottle of wine.